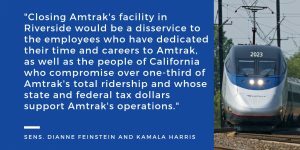 This week saw an extraordinary outcry from California’s congressional delegation demanding that Amtrak keep its Riverside call center open, and 500 TCU/IAM members employed. Combined, the three letters sent this week amount to 40 California members of the U.S. House of Representatives as well as the state’s two U.S. 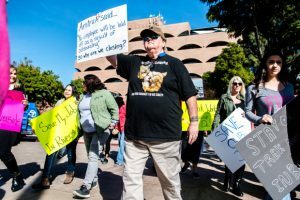 Senators – all with essentially the same message: Amtrak must stop their union-busting campaign, cease any efforts to outsource our members’ work, and keep these jobs in Riverside where they belong. One of the common criticisms from the elected officials is Amtrak’s contracting with a third-party, non-union, low-wage outsourcer in Florida. They pushed back against Amtrak’s claims that if call volumes are indeed dropping and cuts are required, that they should first-and-foremost cut ties with the outsourcer – not shutter Amtrak’s in-house facility that’s home to 500 dedicated, career Amtrak employees. Riverside has been home to Amtrak’s Western Reservations Sales Office for over 25 years, which provides jobs for many veterans and disabled persons who struggle to find quality jobs elsewhere. 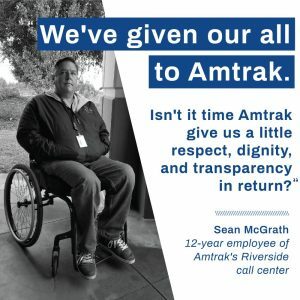 Sean McGrath, a 12-year employee of the call center, penned an op-ed in Riverside’s Press Enterprise newspaper where he described his struggle to find work after suffering a spinal cord injury that left him confined to a wheelchair. Like many at the call center, Sean has grave concerns about how he could manage to pick up his life and move to Philadelphia in the 60-day timeframe Amtrak’s given them. Over the summer, many TCU/IAM members were sent to the outsourcer Teleperformance, Inc., in Port St. Lucie, FL, where they were unknowingly training their replacements. This point also struck a nerve with elected officials as it is viewed as one of the most insulting corporate practices. Amtrak’s President & CEO Richard Anderson has a decision to make: does he continue outsourcing these good, union jobs? Or will he sit down and figure out a way to keep these jobs in-house, in-Riverside where they belong? The post California’s Senators & 40 Reps. demand Amtrak keep Riverside call center open appeared first on IAMAW .